* rpt from * to * to last 2dc and sc, skip 2dc, 1sc in last sc. Turn. Rpt Pattern Row 10 more times, until 12 rows have been worked in all. Fasten off. # 4 rows Main Color. Fasten off. 12 rows Contrast Color 2. Fasten off. 4 rows Main Color. Fasten off. 12 rows Contrast color 1. Fasten off. Rpt from # to # once. Turn. * to * to corner (45 groups worked), sl st to first sc. Turn. sl st to first sc. Fasten off. Finishing - Sew and tie off loose ends of yarn. Flower Motif - Make as many as you wish - Worked in rounds without turning throughout, using main color yarn make magic circle, using 4.00mm hook work ch1, 12sc in circle, pull loose thread of yarn to close, sl st to first sc. Row 2 - ch1, (1sc, 4ch, 1sc) in base of ch1, * skip 1sc, (1sc, 4ch, 1sc) in next sc, * rpt from * to * to last sc, skip last sc, sl st to first sc. to end, sl st to first sc. Fasten off. Finishing - Sew and tie off loose ends of yarn, sew motifs randomly on blanket and attach decorative button to centre. 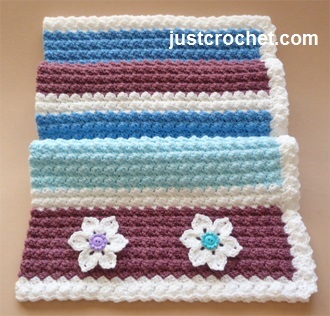 Hope you enjoy this free baby crochet pattern for a everyday blanket.